7:00 p.m. registration and reception: meet your host and guide, pick up registration packets. • Los Alamos: Manhattan Project National Historic Park Visitor Center, visit the Bradbury Science Museum. 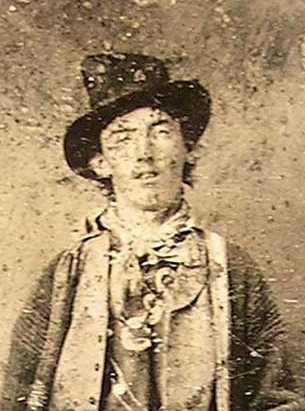 • Drive by Village of Anton Chico followed by stop at Puerto de Luna — rare, private visit to site of Father Polanco's store, where Billy the Kid had his last Christmas dinner as a prisoner of Sheriff Pat Garrett. • enjoy the rest of the afternoon exploring Old Town around the Plaza — click HERE for a handy map of restaurants, galleries, and more). • the bus will return us to the Comfort Inn in the early evening to conclude the tour [retire to your room if you're staying, or catch the hotel shuttle to the airport to catch a flight, or retrieve your car from long-term parking]. Come for the history, stay for the balloons! Albuquerque's famous International Balloon Fiesta will be underway when we return to the city on Sunday. Plan on taking in Balloon Glows Sunday evening, or stick around during the week for a full schedule of events. You'll need to make your own hotel arrangements after the expiration of our group block (our final night is Sunday, October 6. One option may be to extend your stay at the Comfort Inn–Airport). 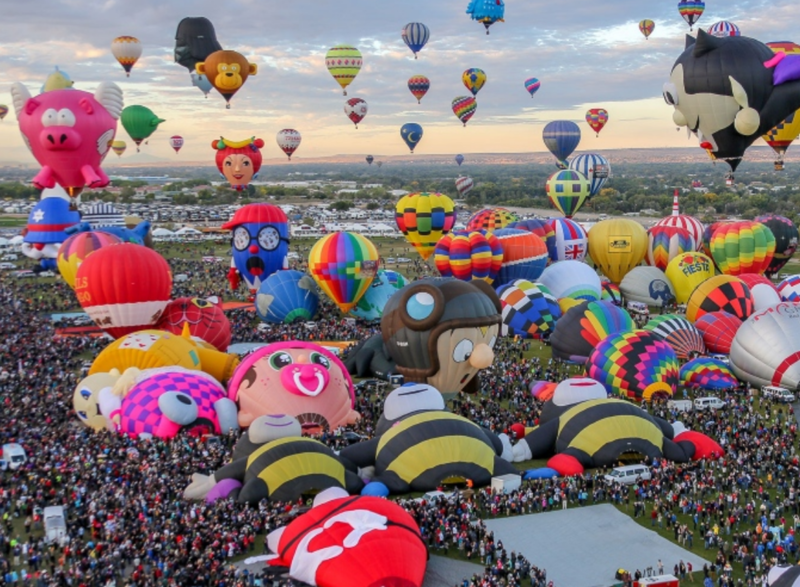 The Balloon Fiesta is Albuquerque's premier event, and hotels rooms will be scarce as we get closer to the event. For more information on Civil War to Cold War in New Mexico, click on the button below and send us an email. 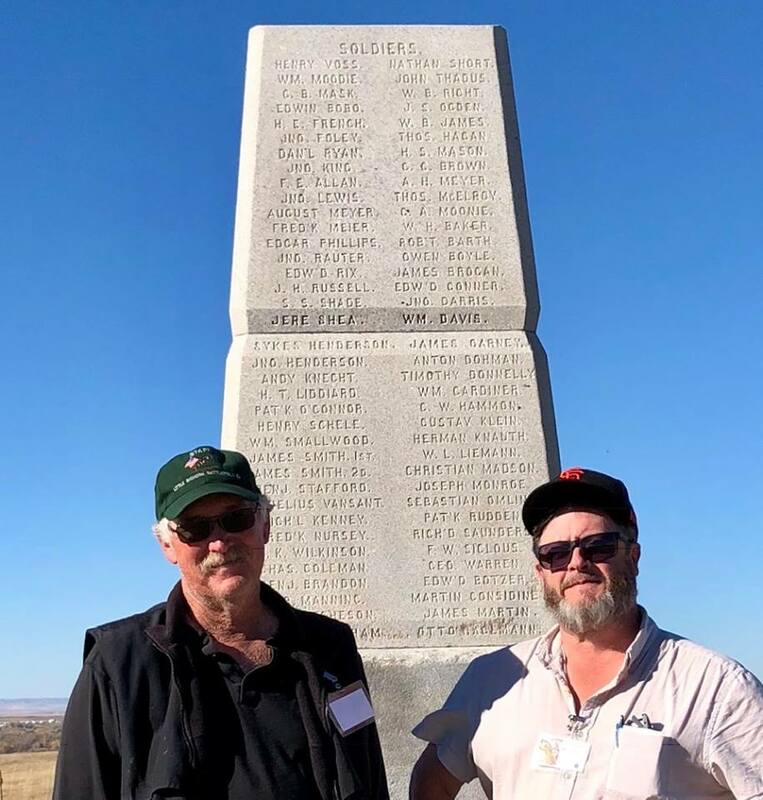 above: Neil Mangum and David Woodbury at the 7th Cavalry Memorial atop Last Stand Hill at the close of last fall's tour of the Rosebud and Little Bighorn. 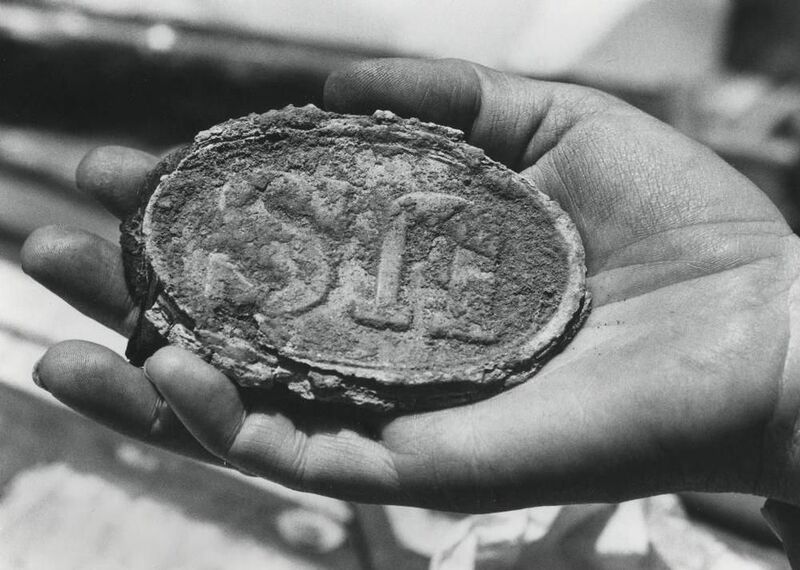 A belt buckle from the mass grave at Glorieta (Department of Cultural Affairs Office of Archaeological Studies). On July 16, 1945, the world's first atomic bomb was detonated approximately 60 miles north of White Sands National Monument (White Sands Missile Range Photo). REGISTRATION : pay the full registration now, or reserve your seat on the bus with a deposit. Your registration includes the opening night reception (including orientation talk), a seat for the 5-day bus tour, 4 delicious lunches, entrance to all museums and historic sites, registration maps and reading materials, and either 5 or 6 nights lodging (depending on whether you choose to stay at the hotel on the final night in Albuquerque). Also included—and most importantly—the guide services and interpretation of our on-board historian, Neil Mangum. LODGING COSTS: There are four (per person) lodging options. Hotel costs will be combined with the Tour cost when you click the corresponding PayPal button (you'll be able to select quantities in the shopping cart). Chose one of four options to "Buy Now" and select a quantity. If you wish to only to reserve seats, use the "Pay Now" button at the bottom to make a deposit. If you have trouble with any of these payment buttons, you can also request an invoice by clicking on the Send Email button at left, and give me your registration details.